I spotted this male Cricket (Family Gryllidae) climbing a wall one evening last September. I would love to identify the species because these are the crickets I most commonly see in my yard. I can tell that this one is a male because it lacks the females' stinger-like ovipositor at the end if the abdomen. 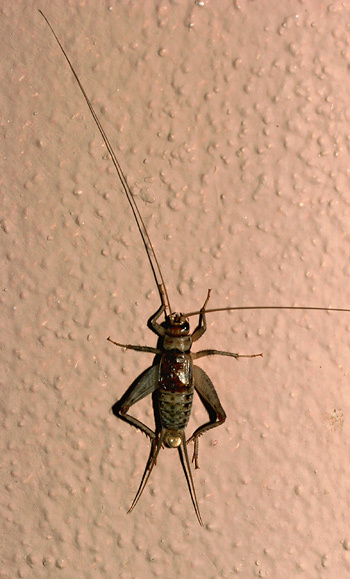 Both male and female crickets have a pair of prominent cerci (sensory appendages) near the tip of the abdomen. I managed to capture this cricket excreting fluid (peeing). Since some of their food has a high water content, insects will need to excrete this excess fluid to maintain a proper balance of water and salt in the body. Their fluid levels are regulated by the homeostatic actions of diuretic and antidiuretic hormones.